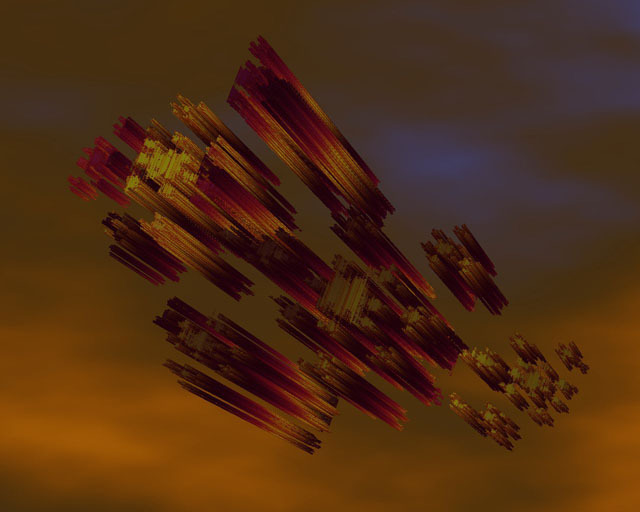 Plugins for a variety of quaternion, Fractint style hypercomplex, juliabrot, mandelbulb and a few miscellaneous fractal types. Raytracing is a process to provide realistic lighting, perspective and hidden surface removal effects to a scene. A raytracer includes includes a camera (or eye) and one or more light sources. The raytrace process can be envisioned as the shooting of rays from the camera to the objects in the scene. The raytracer uses the distance to the intersection point, the surface normal at the intersection point, and the angle and intensity of the light source(s) to determine the coloring at the intersection point. Precise mathematical formulas exist for calculating these parameters for regular solids such as spheres, planes, cubes, etc. To deal with a general curved surface, the general approach of Hart, Sandin and Kauffman in which the distance to the surface is estimated using calculations from the potential and gradient of the fractal as the surface is approached is used. 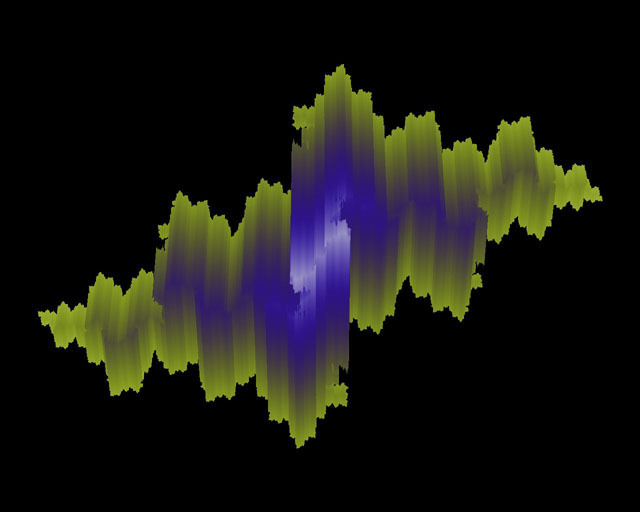 Calculation of the gradient normally requires the derivative of the fractal function. An alternate method for estimating the gradient is also available. A "brute force" method in which small steps are made until the surface is crossed. Surface lighting of the fractal requires surface normals, which are estimated from four neighboring surface points. 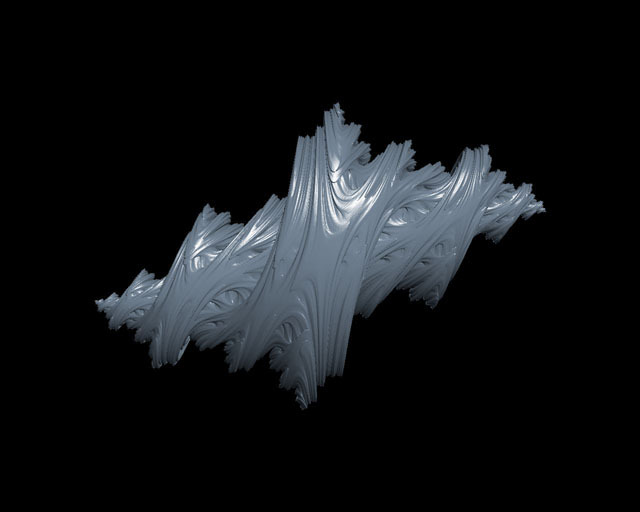 With the default settings the user will see a Phong shaded image for a Julia quaternion. In the fractal formula, closeness determines how closely the distance to the surface of the fractal is calculated. Greater detail will be seen as the closeness is decreased, but the rendering time will also increase. The number of iterations does not determine how closely the surface is approached. The closeness autocorrects for screen size and zoom. The distance and 2D options require require changes to the parameters for the coloring. The next image and upr is an example of distance coloring of a hypercomplex julia. The user should examine the parameters for both the fractal formula and the coloring formula to see how the image is created. Notice that the coloring formula uses a gradient rather than a two color preset. Slicing into a 3D/4D object can give some interesting results. 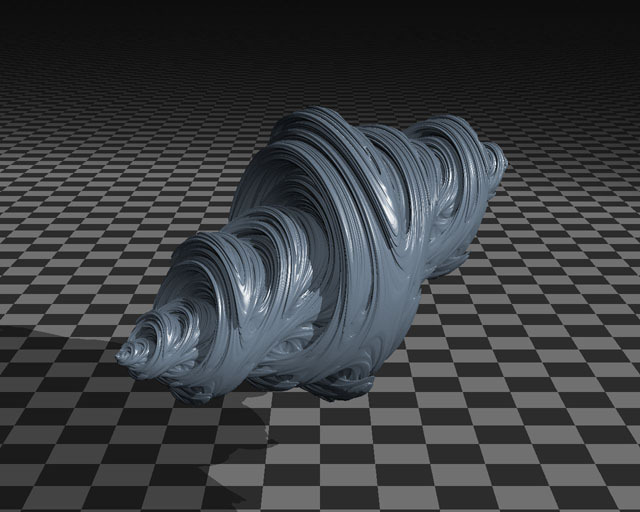 The next example is a slice into a Julia quaternion. The top layer uses the 2D mode, the middle layer uses the Distance mode, and the bottom layer uses the Raytrace (Phong) mode. 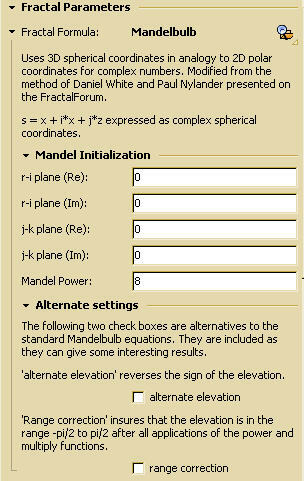 Examine each layer carefully to see the settings for the fractal formula and the coloring formula for each layer. The next example, IncaMask, is a two layer image using the Ikenaga Power Juliabulb formula, with a power value of 5. The top layer uses the Distance coloring mode and and bottom layer uses the Raytrace (Phong) mode with shadows The user should examine the parameter settings for the fractal formula and the coloring formula on both layers. 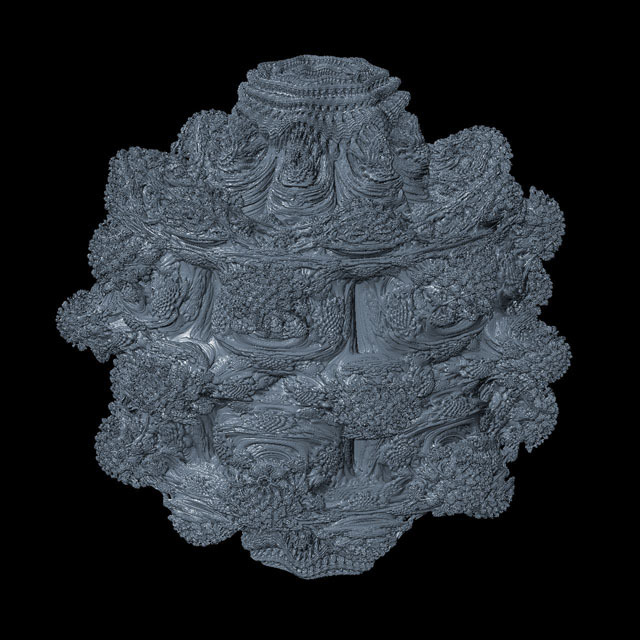 Mandelflowers, which is an image of an 8th power Mandelbulb, has four layers and a mask layer. The top layer is a Distance mode layer and provides the colors for the flowers. The next layer is a Raytrace (Phong) layer with shadows and a partially transparent floor which allows the Terra Firma layer to be seen and still maintain the shadow of the of Mandelbulb on the floor. The Terra Firma layer has a fuzzy mask applied to allow the sky layer to be seen and to provide a distant horizon. The user should examine the parameters on all layers in detail to see how the image is created. This example is a Sci-Fi style image that takes a different approach with the coloring formula in that both the Distance and Raytrace layers are colored using a gradient. 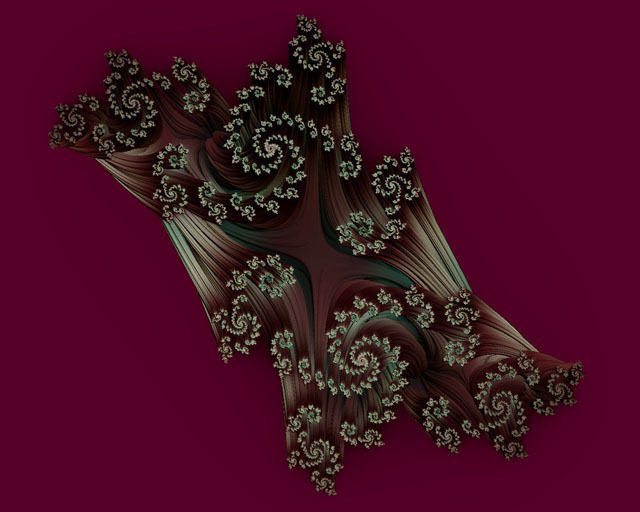 The fractal is a Hypercomplex Julia object. The user should examine the parameters on all layers in detail to see how the image is created. Phoenix Landing, which features a phoenix juliabrot, is the most complex image in the tutorial, and features several formulas besides 3D Fractal Raytrace and 3DFractal Coloring Direct. It is comprised of 7 layers and 2 masking layers. 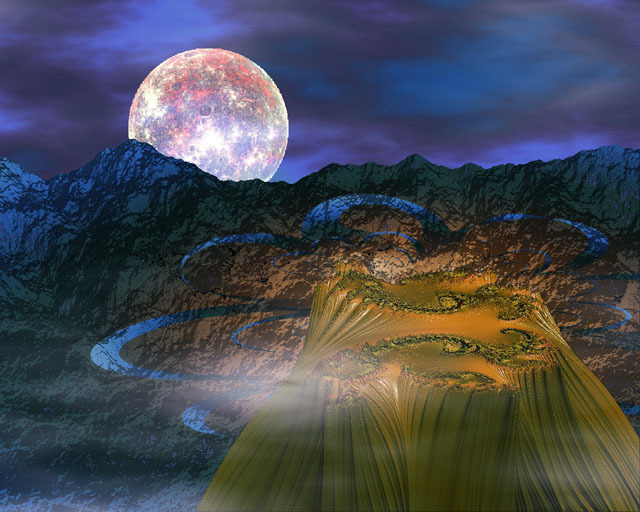 Two of the layers (Phoenix Top and Landing) use the 2D mode of 3D Fractal Raytrace. 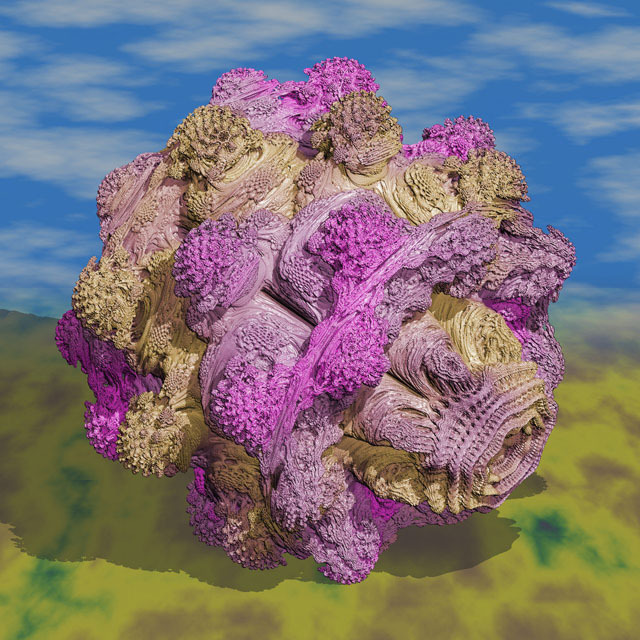 Unlike the previous example with the 2D mode, 3D Fractal Coloring Direct is NOT used. This requires that the compatibility check box be unchecked in 3D Fractal Raytrace. 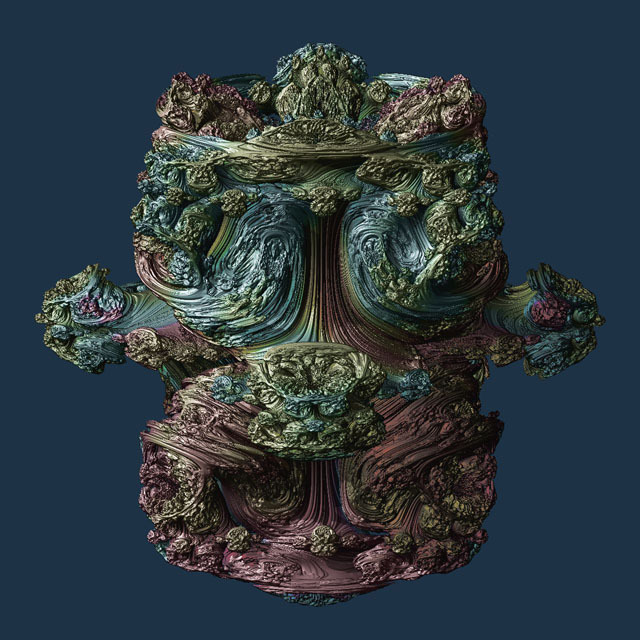 Another 3D fractal type is introduced which uses a pixel formula for the fractal formula and Landscape for the coloring formula. It is used for the mountains. The user should examine the parameters on all layers in detail to see how the image is created.